This beautifully crafted and solidly researched book explains why and how the United States made its first commitment to Vietnam in the late 1940s. Mark Atwood Lawrence deftly explores the process by which the Western powers set aside their fierce disagreements over colonialism and extended the Cold War fight into the Third World. Drawing on an unprecedented array of sources from three countries, Lawrence illuminates the background of the U.S. government's decision in 1950 to send military equipment and economic aid to bolster France in its war against revolutionaries. That decision, he argues, marked America's first definitive step toward embroilment in Indochina, the start of a long series of moves that would lead the Johnson administration to commit U.S. combat forces a decade and a half later. Offering a bold new interpretation, the author contends that the U.S. decision can be understood only as the result of complex transatlantic deliberations about colonialism in Southeast Asia in the years between 1944 and 1950. 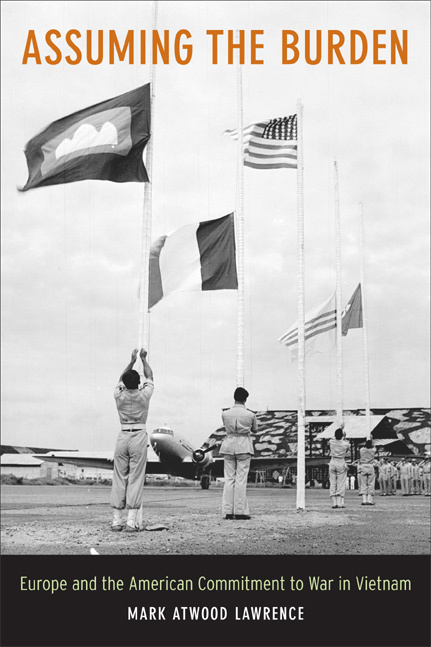 During this time, the book argues, sharp divisions opened within the U.S., French, and British governments over Vietnam and the issue of colonialism more generally. While many liberals wished to accommodate nationalist demands for self-government, others backed the return of French authority in Vietnam. Only after successfully recasting Vietnam as a Cold War conflict between the democratic West and international communism—a lengthy process involving intense international interplay—could the three governments overcome these divisions and join forces to wage war in Vietnam. One of the first scholars to mine the diplomatic materials housed in European archives, Lawrence offers a nuanced triangulation of foreign policy as it developed among French, British, and U.S. diplomats and policymakers. He also brings out the calculations of Vietnamese nationalists who fought bitterly first against the Japanese and then against the French as they sought their nation's independence. Assuming the Burden is an eloquent illustration of how elites, operating outside public scrutiny, make decisions with enormous repercussions for decades to come. Mark Atwood Lawrence is Assistant Professor of History at the University of Texas at Austin.